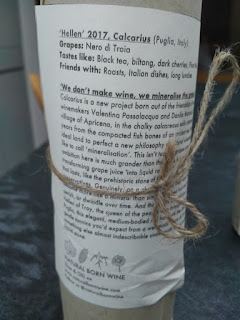 A Plea for Diversity in Wine. Austrian haul: 204 varieties in one go. 204 varieties in one go? Fortunately 200 of them were in the same bottle. This has to be a record for a field blend. The estimable Weingut Leth of Fels in the Wagram area of Austria is one we have had occasion to admire before. We particularly like their Roter Veltliner. Fels is just under 50 Km from Klosterneuburg, itself practically a suburb of Vienna which is only 16.5 Km away. Klosterneuburg hosts the Federal Institute for Viticulture and Pomology where Fritz Zweigelt bred Zweigelt and Blauburger so is a significant address in grape breeding. It is also a major wine school. "Franz Leth senior realised his dream to plant a mixed vineyard of rare and ancient grape varieties some 20 years ago. No one would have expected that it would become home to more than 250 varieties in one single vineyard. In cooperation with the Klosterneuburg wine school, researchers and nursery schools, he has made 15 seedlings of each individual species, identified them with a sign and cultivated them. The goal of the collection has always been to preserve virtually extinct, traditional and regional grape varieties. Today, the collection includes regional varieties from Lower Austria, but also rare varieties once native to the Steiermark, Burgenland, Italy, Hungary, Germany, the Czech Republic and the USA. Meanwhile the variety of vines is the largest of its kind in Austria and forms a fascinating and popular field of activity for research." Approx.20 more, unknown or just . 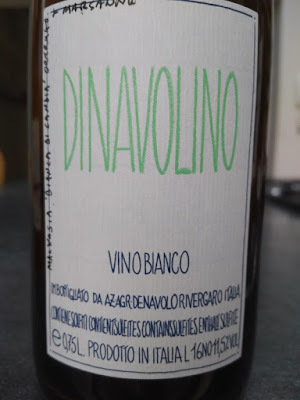 Winemaking: All white varieties, (approx. 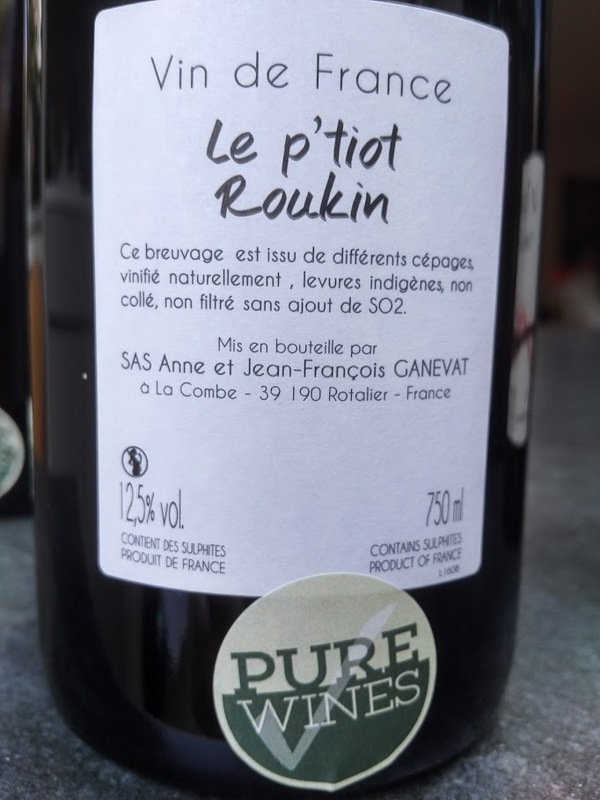 200) are harvested together as a field blend, pressed, fermented and matured in one wine. Only the finest and ripest bunches of each variety are used for this project to guarantee top quality. To provide the extraordinary array of fruit flavours, the wine making process is done completely in stainless steel. After maturing six month on lees, bottling is done usually in May. and a Zierfandler/Rotgipfler blend by another good Winzer, Alphart. Where were we able to find all these rarities? Not in one of the larger cities but at the ski resort, Lech am Arlberg. Most of these bottles came from Pfefferkorns Supermarket. Norther Calfornia, 8.2.19. Particularly nasty weather. What good is California without the sun? The thought entered our heads during our stay in February this year. Snow in Seattle, biting windchill in San Francisco and sodden misery in LA. Well, there are always the restaurants and they do need the rain. Chez Panisse has been there for a very long time indeed (we first visited there in the mid-1970s) and is as good as ever. That is an incredible achievement in the US - particularly California where change happens. Chez Panisse is still a very hot ticket so we were determined not to arrive late. Domaine Mosse's Le Gros is Grolleau Noir blended with Gamay, Grolleau Gris and Cot from the Loire of course. At 12.5% it was the perfect wine to sip while waiting for the rest of our party. In fact it was so good we had it with the meal too. It's a Louis-Dressner import. You will never be unhappy with any wine with their name on the back. We can't think of many other importers of which this is true. They are so good that Chambers St. Wines of New York, the worlds best winemerchant hold an annual Louis-Dressner evening. after dinner we were lucky enough to be given a tour of the kitchens by Fanny Singer, the daughter of the founder of Chez Panisse, Alice Waters. We had never seen such beautiful and well appointed kitchens. Everything was luxurious and sparkling. Clearly everyone working there was happy and that must be the secret - oh and having one of the world's greatest and most influential restauranteurs as your founder and owner. It was good to see Vino Volo still going strong at San Francisco airport. We include this great place under Californian restaurants because they do serve food (we didn't eat any of it but it looked OK) and there are branches at 4 Californian airports as well as all over the rest of the country. Of the various flights we chose Winter hites (Semillon, Riesling and Grenache Blanc) and Stranger Things (Pinot Meunier, Pais and Tannat). Our next memorable meal was at Bestia in downtown LA. Where to begin? Imagine what was referred to as a sort of dealer-and murder-alley in a corner of the city almost made for a Quentin Tarantino movie. Add a beautiful American/Israeli and Ukrainian/Egyptian couple (both chefs), a good backer, some urban regeneration (the alley is now a mixture of residential, art studios and other enterprises) and you have the funkiest and most sought after place imaginable. Even though large (the staff alone number 105) legend has it that it is impossible to get a reservation. We were obviously lucky to get a table outside and under cover. It was raining and chilly (note the heaters) but we were happy. The food was absolutely outstanding. 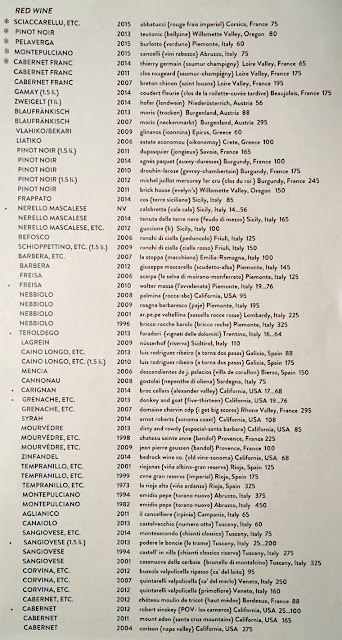 the winelist is probably unique in being published anew every day. The Chief Sommelier is Ryan Ibsen. He is a real enthusiast whose aim is to add to peoples' existing knowledge by suggesting wines to augment their pleasure. He prefers to deal with a range of producers and importers who have small stocks so wines sell out quickly giving him the chance to add new ones on a daily basis. 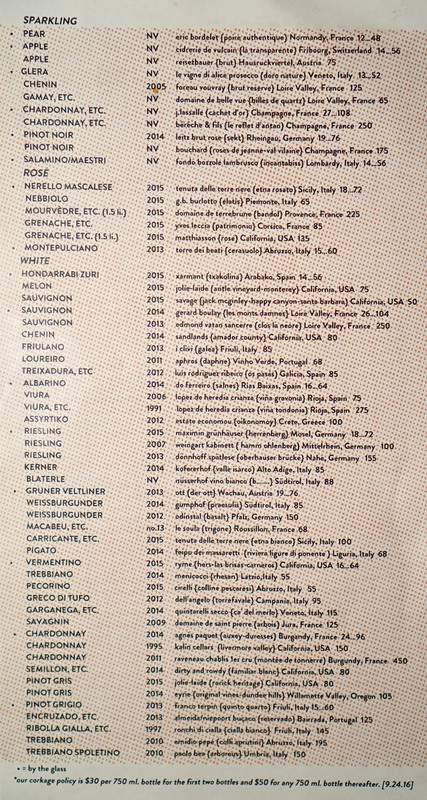 The winelist is organised by grape variety and is extensive. 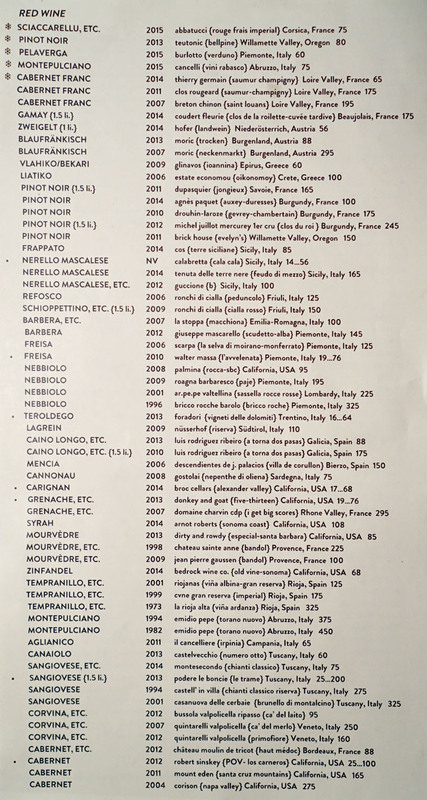 Clearly everything has been well chosen and even the most familiar appellations have something interesting to offer. The service was also outstanding. Our guy was a hoot and very efficient with it. Asking as we do about alchol levels, we were sent the Sommelier who we later realised was Ryan Ibsen himself. 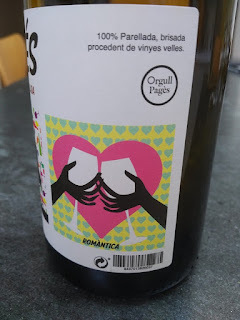 He was charm itself and seemed genuinely happy that we chose this Malvasia from Salina (11.5%) which despite more than one visit to the island we had never seen before. We had a nice conversation about Salina, Lipari and whatnot. The wine was perfect. Gjelina is crowded with young people on their phones. 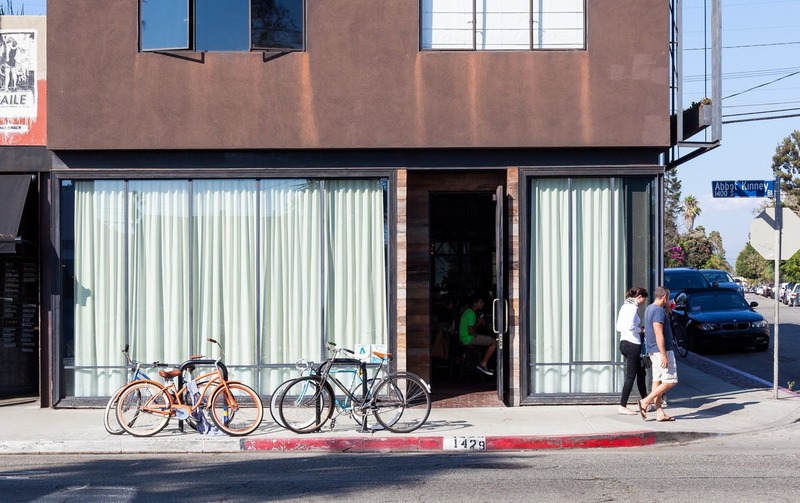 A reservation at Gjelina in Venice Beach is also extremely difficult to obtain. Ours was inherited from a couple unable to take it up due to an alarming leg injury invilving an avant-garde coffee table. Fortunately recovery has been effected and now the said leg is just as weak as the other one (a Dylan Thomas joke by the way). the restaurant was founded in 2008 and specialises in Italian/American food with emphasis on beautiful vegetables. The menu is long, but everything is delicious. It bears a warning we have never seen before: "changes & modifications politely declined." Oh, and there's loud music, but not just any loud music. Gjelina make a point of displaying the covers of their albums on their website. Another first. We were becoming accustomed to the wonderfully electic winelists to be found in these Californian restaurants and Gjelina's didn't disappoint. 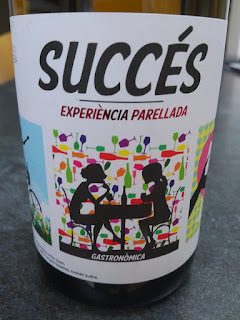 How often do you find wine from the Azores? 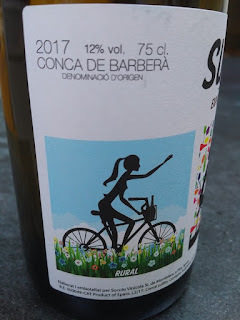 This Verdelho (12.5%) was just great. 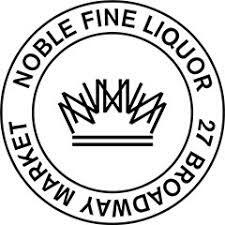 "Since 1976 we've been proud to offer the world's finest wines, great service and competitive prices. 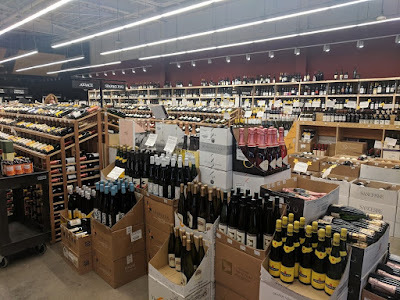 We offer thousands of wines on this site with inventory updates happening in real time. 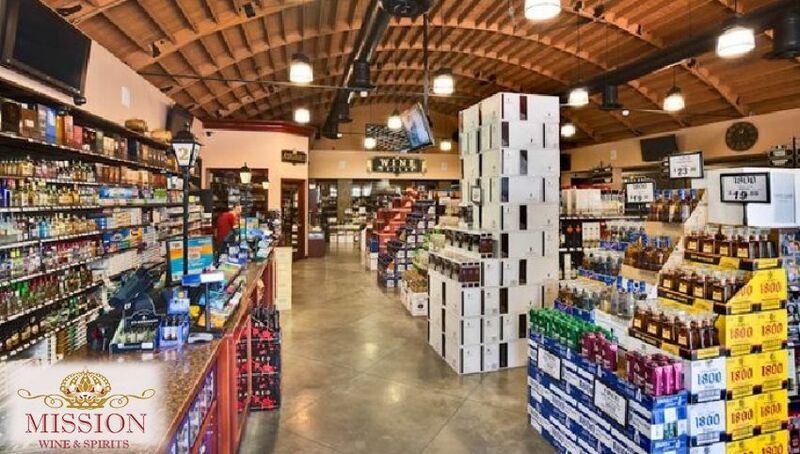 In addition we operate three retail stores, in San Francisco, Redwood City and Hollywood, California." 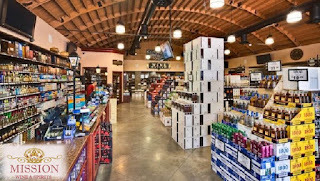 K & L Wine Merchants in San Francisco is situated downtown rather than on the outskirts but is big enough to qualify as a superstore. and a Californian Valdiguie too together with others enough to make a good impression. 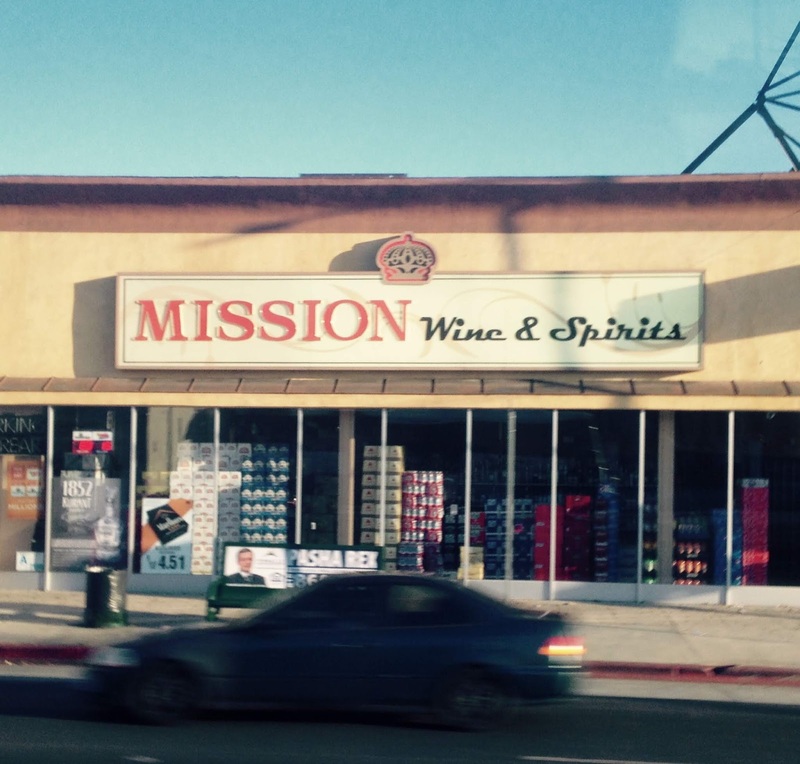 Mission Wines and Spirits is in Pasadena, also relatively accessible. We had discovered they stocked something we had been looking for for more than a decade - Jim Clelenden's Au bon Climat Aligote. All those years ago this wine had made a deep impression on us. It brought a realisation that some European grapes actually do much better in the New World than in their original terroir. Aligote had always been nice enough yet somehow disappointing before tasting this Californian version. Even Eastern European Aligotes hadn't exactly bowled us over. This one did. After all those years of literally fruitless searching, we thought that our bottle had been a one-off and would never be repeated. Even so when preparing for our trip to California we put it in Winesearcher and bingo! There it was at Mission Wines and Spirits. Mission is a barn of a place it must be said more devoted to spirits than to wine these days. Chaps were trundling barrows of cases here and there. We tried hard to find our bottle but it was a bit like finding your food additive in a vitamin shop. 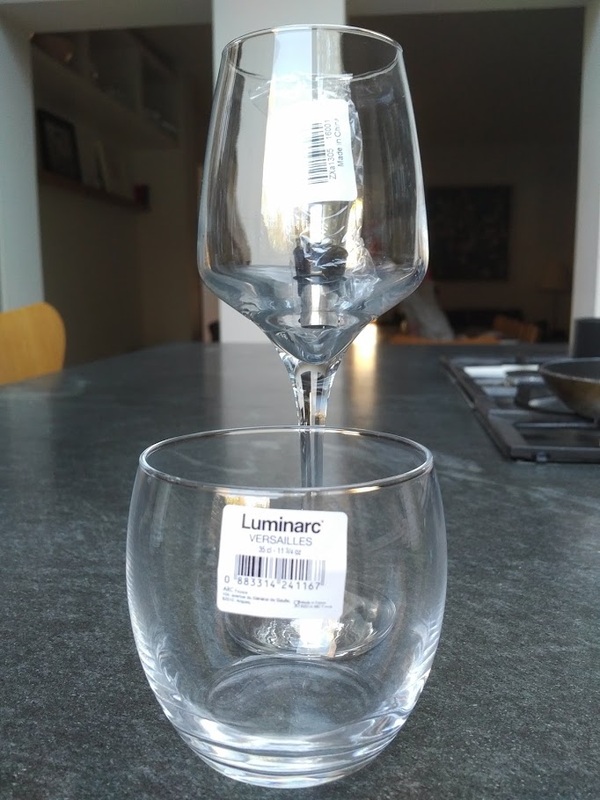 We were beginning to get worried they no longer in stock but a guy behind the desk soon put his hand on our bottle. Even if it turns out not to be as good as our memory, we can't be more excited to taste this Aligote from the sunshine state. 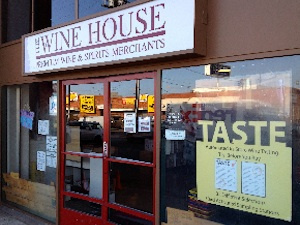 The Wine House has been serving customers from around the world for over 40 years from our 18,000 square foot facility in West Los Angeles, CA. This is the spiel of Los Angeles's Wine House and like K & L and Mission they have the scatter-gun approach to being as inclusive as possible. It was hard to know if their store was downtown or not but it is certainly close to the city rather than in the surrounding area (we must try to get a handle on LA one day). We had come for this Croatina. Originally noticed on Justerini and Brooks winelist we had planned to sidestep their 6 bottle minimum by buying this bottle on our trip to LA. Again there was a slight flurry before it was found but a very helpful gentleman went into the warehouse (attached to the store) and emerged with our bottle about 10 minutes later. While twiddling our thumbs, what do you think happened dear Slotovino reader? Another New World Aligote suddenly popped up - this one from Mexico! A bit more expensive than the Clelenden we had bought at Mission, we left it undisturbed. We already had too much to take home in hold luggage but we know where to go if we ever need to try another New World Aligote. We have been busy scouring all sorts of places abroad but there remain a terrific and ever-changing variety of outlets in London. Outlets because they are not only shops but market stalls and online merchants as well. 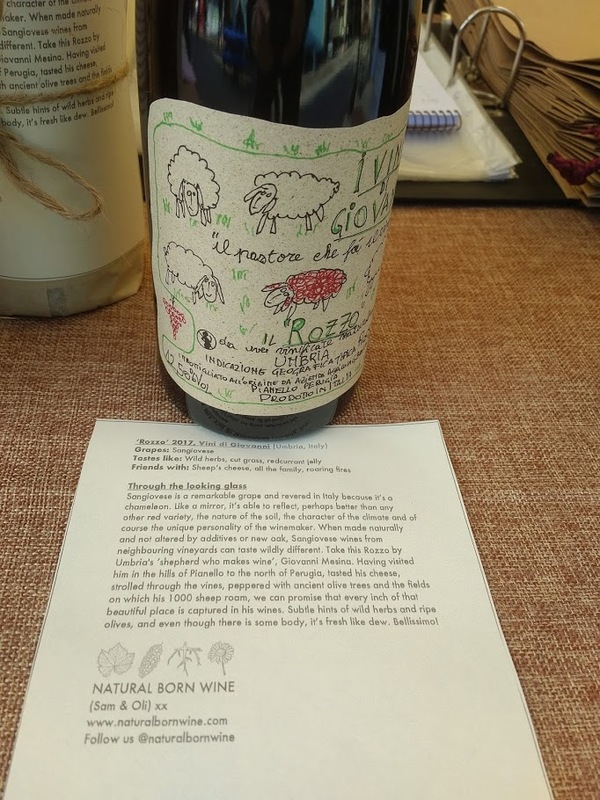 Natural Born Wines is a combination of the last two. 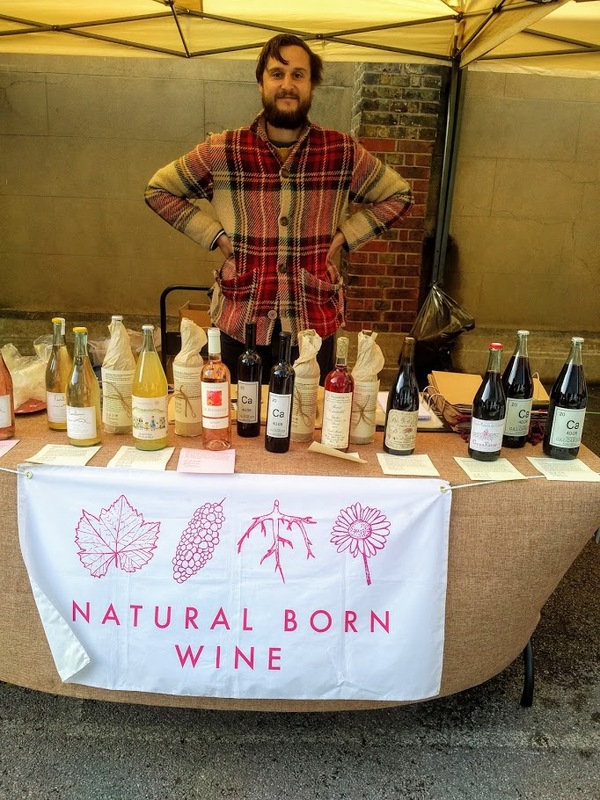 You can buy their wine online or at markets such as Victoria Park Market or Broadway Market which is where we found them. They also hold events at various pop-up establishments and other venues. They are also importers and here they are able to create their house style. 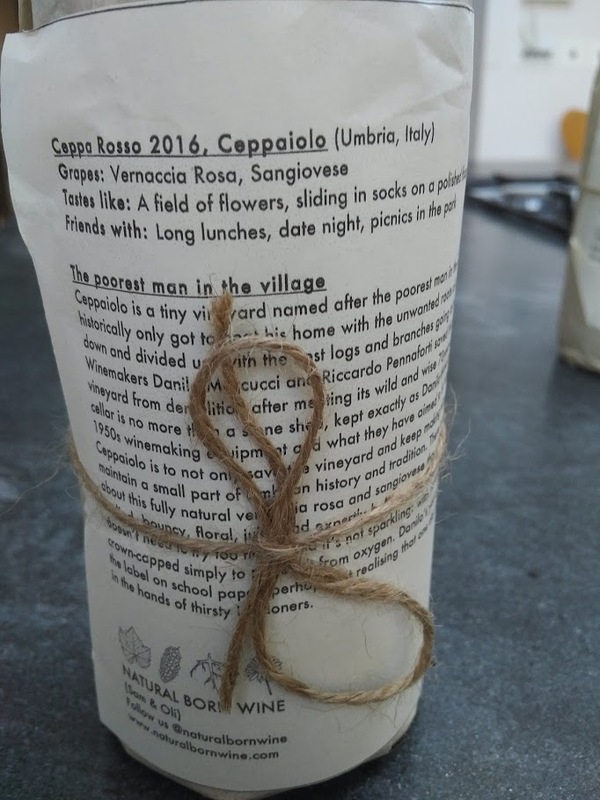 This can be characterised as wines that reveal the nature of their varieties and terroir. From the name it goes without saying that all wines are natural minimum intervention ones. 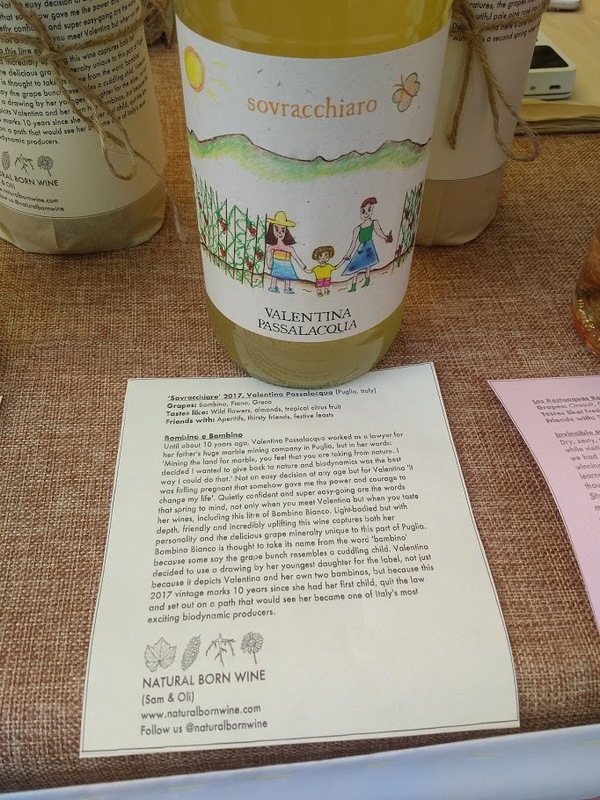 They come from small producers predominantly from Italy. There is no attempt to be all-embracing. It is said that when Rilke returned a book he had borrowed, he would bind it with a ribbon, such was his love of books. 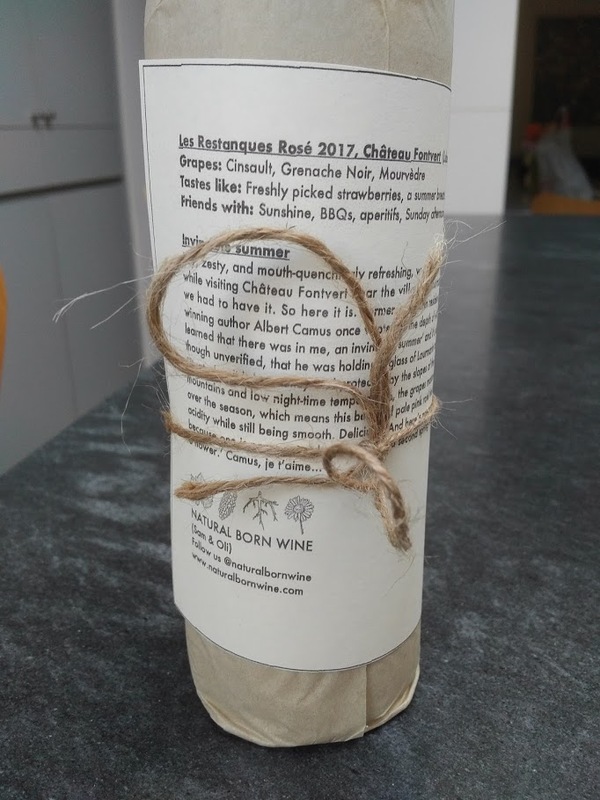 Something Rilkean is going on with Natural Born Wines as you can see from the way they present whatever bottle you might have selected. Like all their wines, this Nero di Troia is probably different from any other you may have tasted. At only 11,5%, lighter but more expressive of the variety. This is a defining example of what NBW is about. We bought this bottle because we had never heard of Vernaccia Rosa, here blended 50/50 with Sangiovese. The joke is that no one else (D'Agata, Robinson/Harding/Vouillamoz/Galet) had heard of it either. 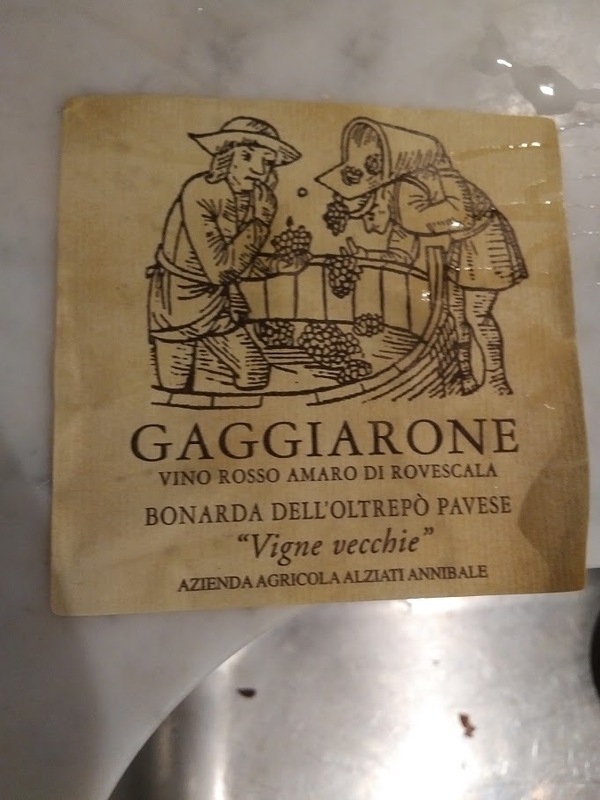 Who are we to doubt that Vernaccia Rosa does indeed exist and indeed forms part of this wine but more prosaically, it may just have dropped an 's' and is actually Vernaccia Rossa - well documanted in all of the above. Delicious wine in any case. 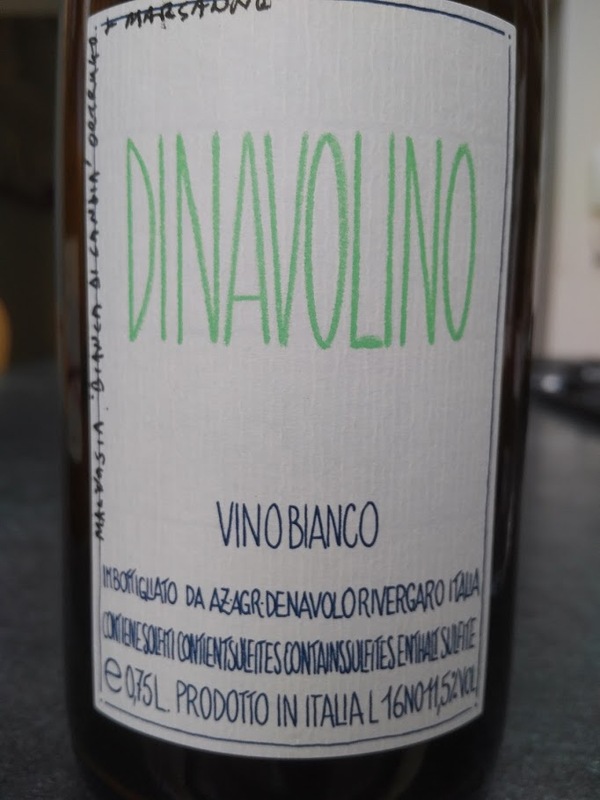 A high proportion of NBW producers are from Umbria as is this Sangiovese. 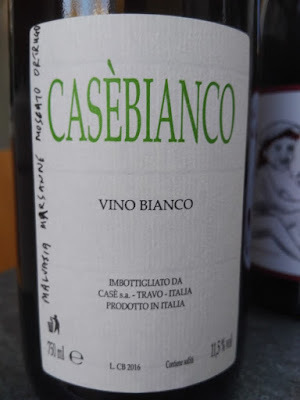 Again, this wine is distinctive in a similar way as the Nero di Troia. The prevailing elements of extraction, concentration, power and so forth are absent from these wines. 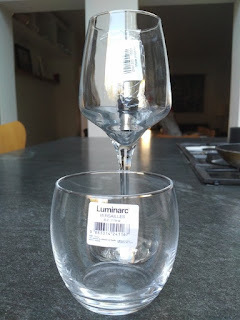 Interesting because most plugs for wine tout those elements as a given if a sale is desired. Check out Swig's or Lathwaite's newsletters. 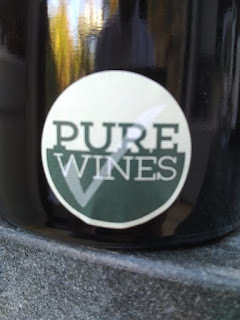 If Natural Born Wine compensates for not actually having a shop by marshalling all manner of initiatives there remain more conventional operations such as the online retailer Pure Wines. If you can find it in your heart to call 'charming' a company with let's say a certain degree of disorganisation, then Pure wines is indeed charming. Don't be too frustrated if out of stock wines are on the website. 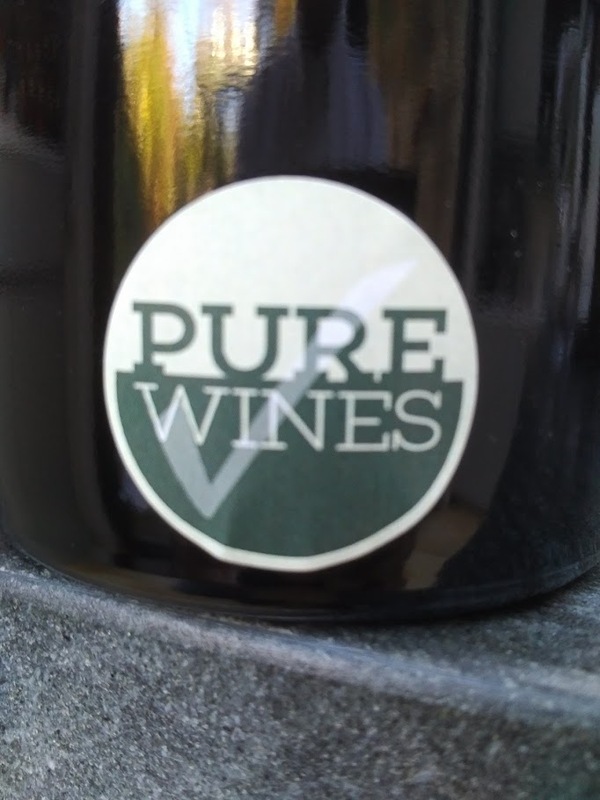 Pure Wines heart is in the right place and if you order even half a case you might get a free gift (or two) to boot. 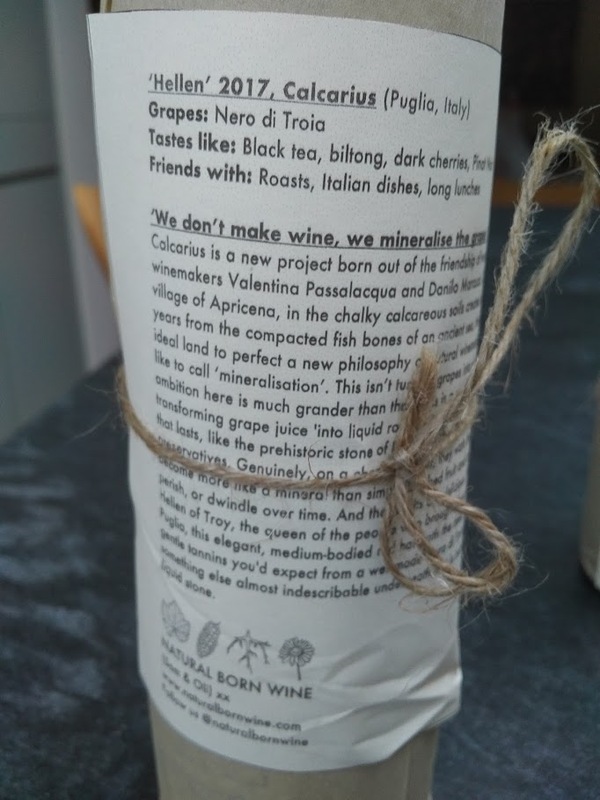 Again the idea is Natural Wine: 'honest and transparent, organically farmed and made with little to no intervention' as they have it. Pure Wines are not exclusive importers so some of their wines may be found elsewhere but they do have some particular wines you may not have seen before. 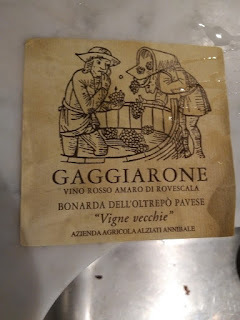 Initially we were drawn to Pure Wines in our quest for a decent Croatina - one which led us eventually to the Mecca of Bonarda dell'Otrepo Pavese, Rovescala itself but that is for another post altogether. Gaggiarone belongs to the more powerful Croatinas. Lovely wines to be sure but less expressive of the variety than the 12.5 percenters in our view. 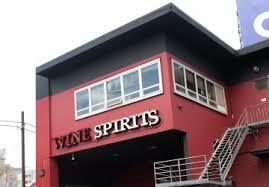 Did we say you might find their wines elsewhere? Not this old favourite discovered by Slotovino at Oenorama in Athens 2014 and privately imported by us for our own use soon after. 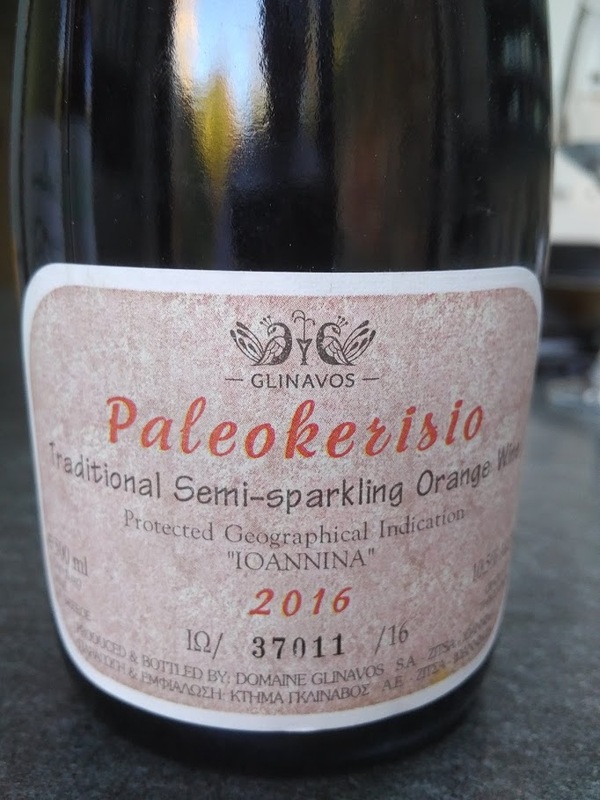 We have been delighted to find Glinavos's Paleokerisio (sparkling blend of white Debina and red Vlahiko grapes) at Flatiron Wines of New York and San Francisco - and now here! Pure charged £12 for this bottle but that may have changed. It's certainly worth a punt at that price. 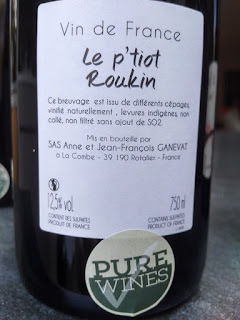 Anything produced by Ganevat is worth trying even with a questionable label such as this. 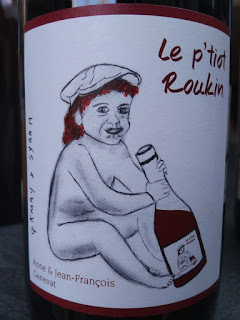 It's a Gamay/Syrah blend. Not something we would have rushed to buy normally. Other sellers charge considerably more than the £21.78 we paid at Pure Wines. Casebianco also hails from Emilia Romagna and is a field blend. 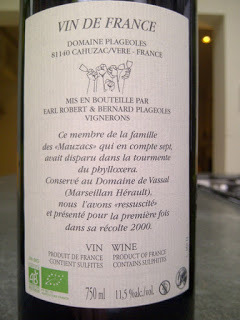 On one of our first visits we bought this Mauzac from Plageolles for example. 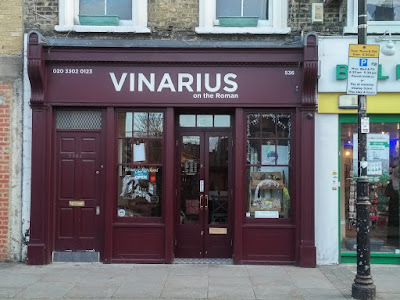 A more recent discovery - at Bow, even further to the East was Vinarius. 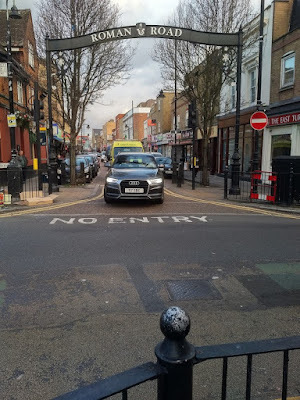 the address is Roman Road which turned out to be a nice market sort of street. There really was a Roman road here, leading to what is now Norwich apparently. 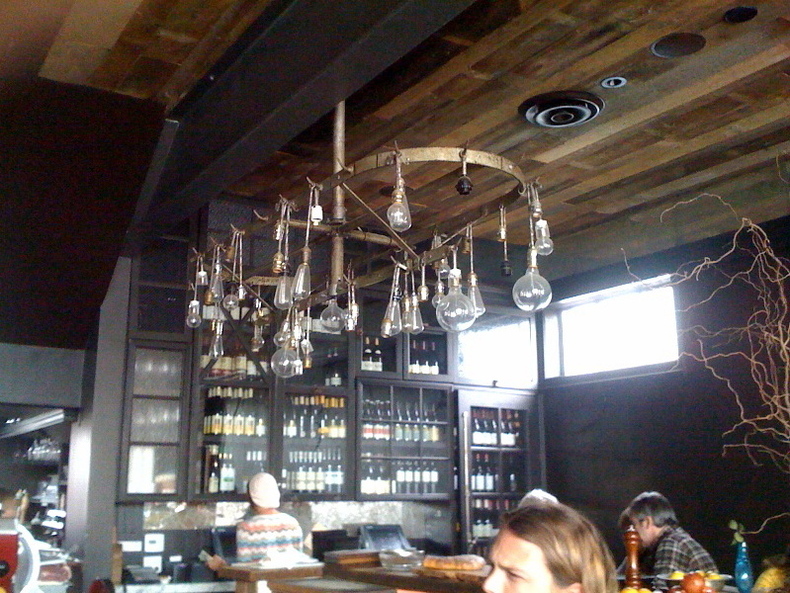 This is a more conventional wine merchant and Enoteca (as so many are these days). 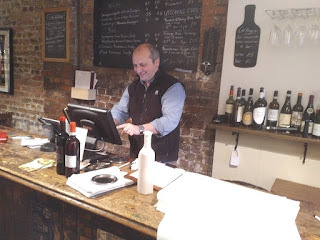 Here we met one of the most charming people you can find in any of London's wine shops - Eugenio - a qualified oenologist and member of the International Wine and Spirit Competition’s judging panel. Eugenio is from Abruzzo but the most outstanding of the four bottles we bought from him was this delectable Tuscan Canaiolo. Not something you can say of every example of this tricky yet great grape. 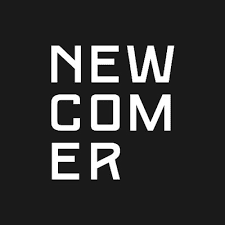 Finally, we made it to Newcomer Wines in Dalston. 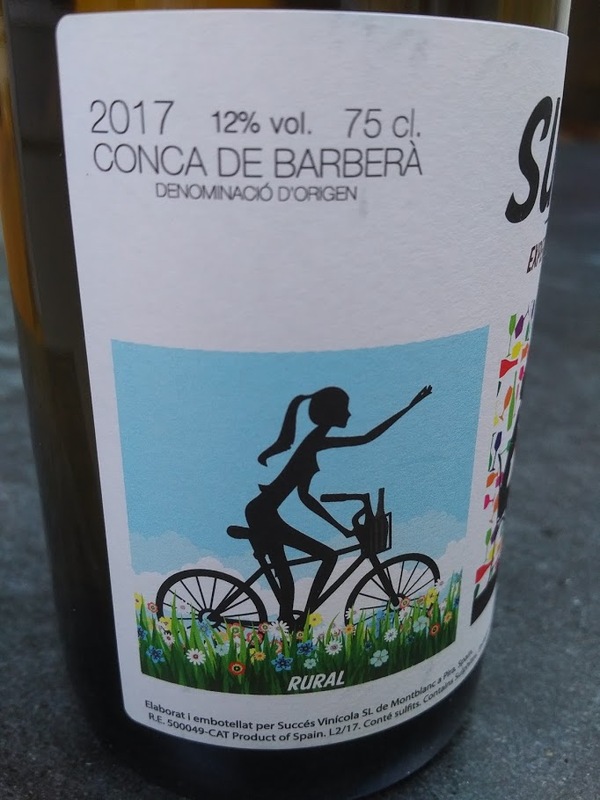 They describe themselves as a neighbourhood wine shop and bar specialising in artisanal wines from sustainable producers but in fact they are the Austrian specialists par excellence. 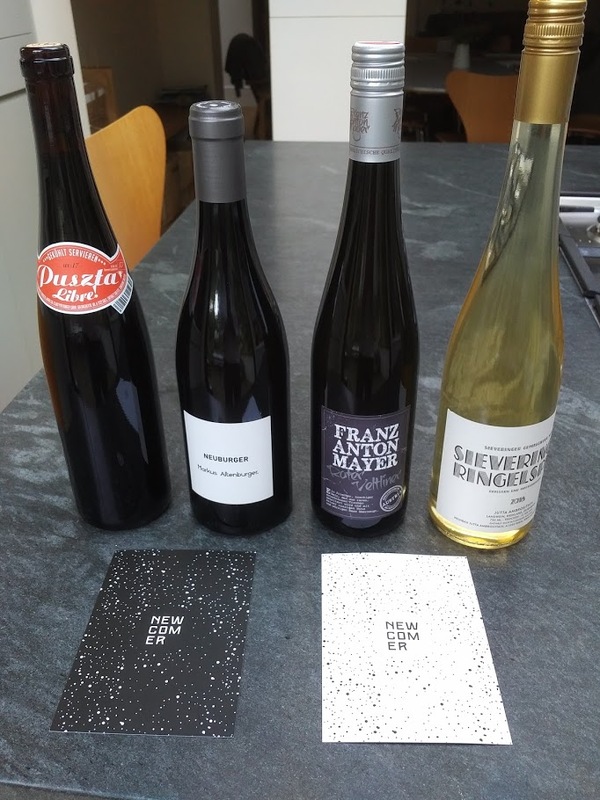 To find any more native Austrian grape varieties you really would have to go to Austria and even then not every winemerchant would have the range you can find at Newcomer.